A theme seems to be developing, here in the BrainLazy reviews: 3D concepts adapted to 2D gameplay. 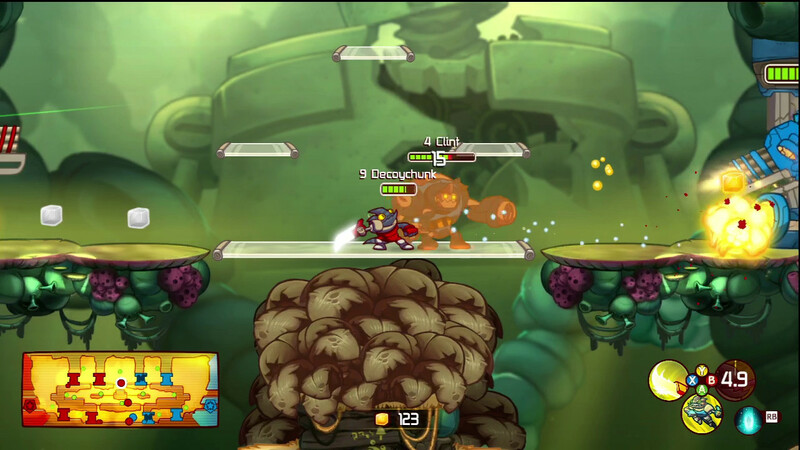 First was our review of 2D survival horror game Lone Survivor, and now we look at Awesomenauts, a DotA-style platformer from Ronimo games. Everything that needs to be said about the visuals of this game, and the game in general in fact, can be found in their phenomenal intro video. Not only does that look like the intro to a Saturday morning cartoon, it looks like one I would have watched. While the game proper does not have quite the same level of cartoon goodness, it is still an extremely attractive and well made piece of cel/vector-style art. 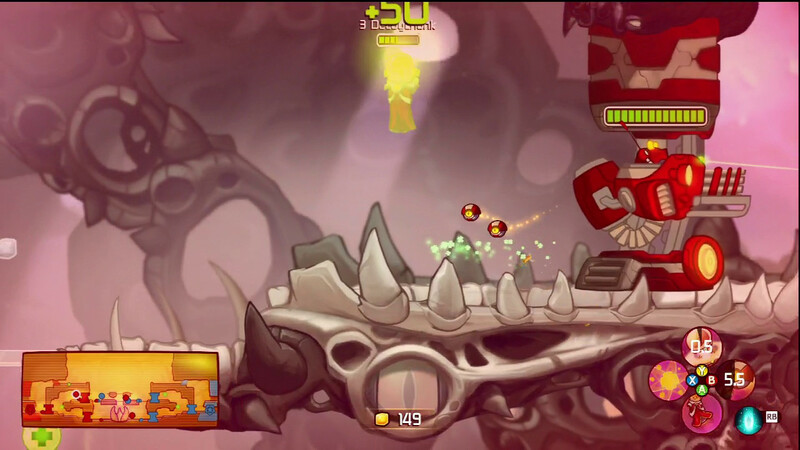 The animations are highly detailed and extremely varied. Leon the Chameleon’s sword swipes, depending on the current speed and whether they were delivered as a back stab or not are visually different. Likewise, Voltar, who does most of his fighting by deploying bots, deploys the combat bots from beneath his robe with a flutter (creepy) and deploys the healing bot from above with an automated arm. Fix me up, little jar-o-healing. The level of detail is no less impressive on the levels. The health critters are different depending on the level, and I’d played through the first level a dozen times before I noticed that there was a massive robot laying in a ruined heap in the background. 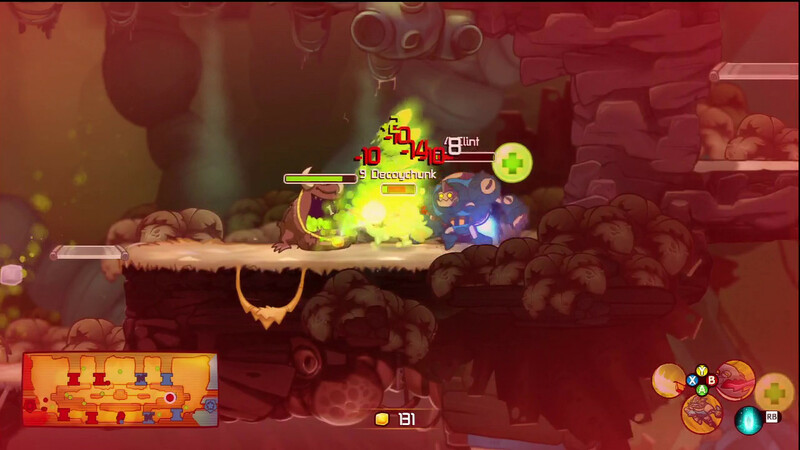 The UI is good, with the health of friend and foe alike indicated with the traditional health bar. Minor things like the droids have itty bitty little bars that grow when they take damage, such that you only have a really clear indication of the health when it is absolutely necessary to. 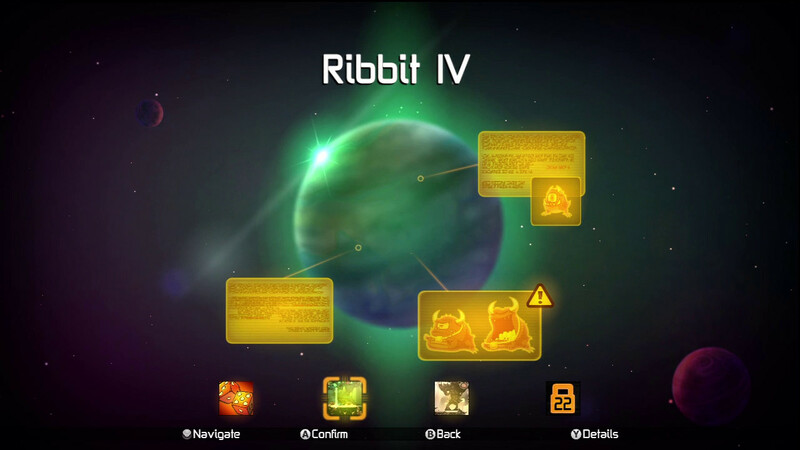 A minimap gives you a good overall view, clear cooldown timers and power indicators are scattered around the edges. Overall, pretty AND functional. If I were to refer to this as a DotA clone, or compare it to League of Legends or Demigod, you’d know exactly what to expect, assuming you know what those games are. For fun, let’s pretend you don’t. 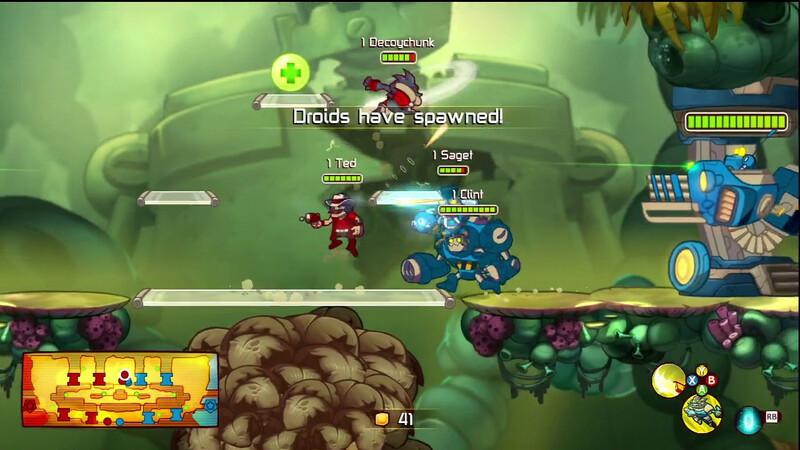 Imagine a tower defense game, except there are two teams, each sending out bots, and each with towers of their own. Now imagine each side deploying a team of unique and imaginative characters who are dedicated to helping the bots and slicing up the other team, using upgradeable skills to do it. Okay, you got that? Now turn it sideways so that it is a platformer. 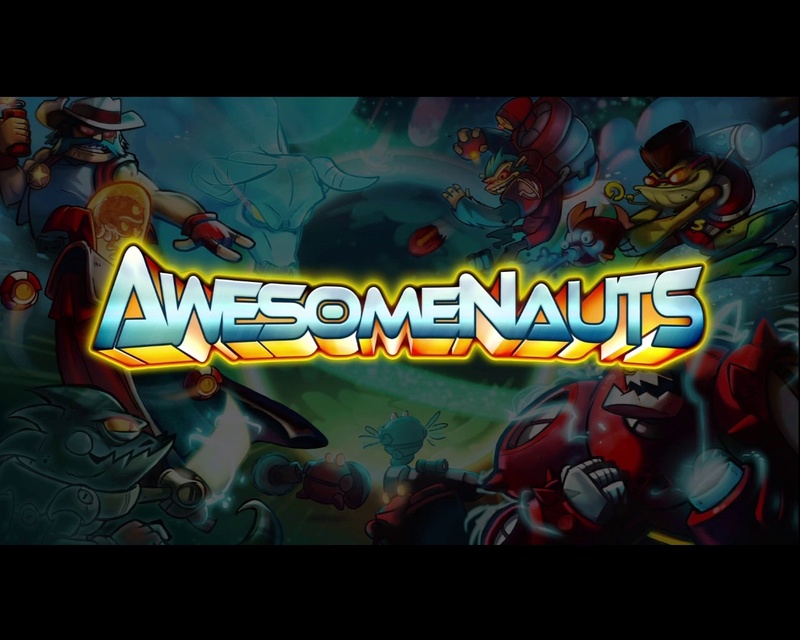 That’s Awesomenauts. Lizard versus Robot? I bet I could take him. One of the key things that makes this take on the genre great is that the plaformer is inherently a much more active and skill-based scaffold upon which to build a game like this. 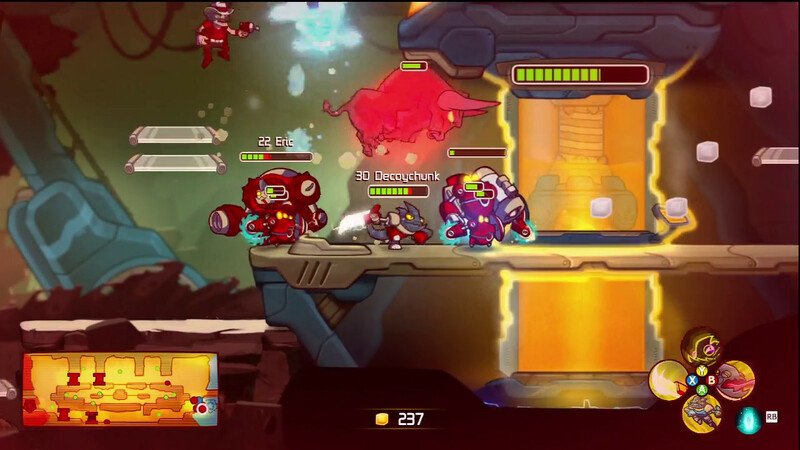 Whereas most other games of this type are built on RTS roots, and thus require you to progress in an optimized and micromanaged sequence, things in Awesomenauts feel far more fluid. 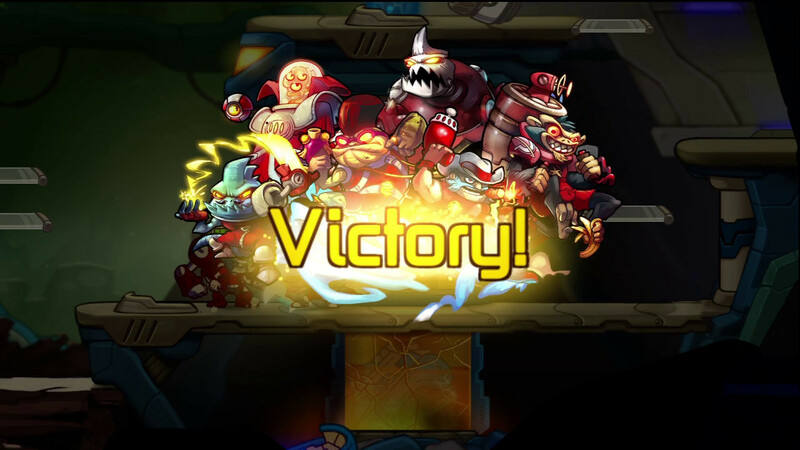 Even when you are hopelessly outclassed by the opposing players, there is always the sense that if your reflexes and techniques are good enough you can still eke out a win in any given showdown. The cast of characters is highly diverse, and caters to a variety of different styles. 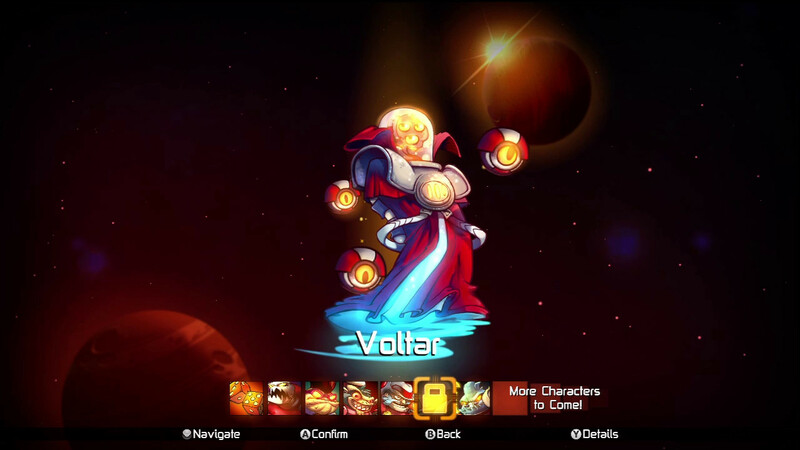 The aforementioned Voltar is a support master, beginning any given battle with no means to attack. Upgrade him with some battle drones, though, and not only can he defend himself, but he can confound the targeting of a turret while boosting the health of the droids hacking away at it. Leon (pronounced Lay-own… he’s french) is the assassin of the group, with a powerful, short range attack and the ability to upgrade cloaking, decoy, snare, and critical hits. 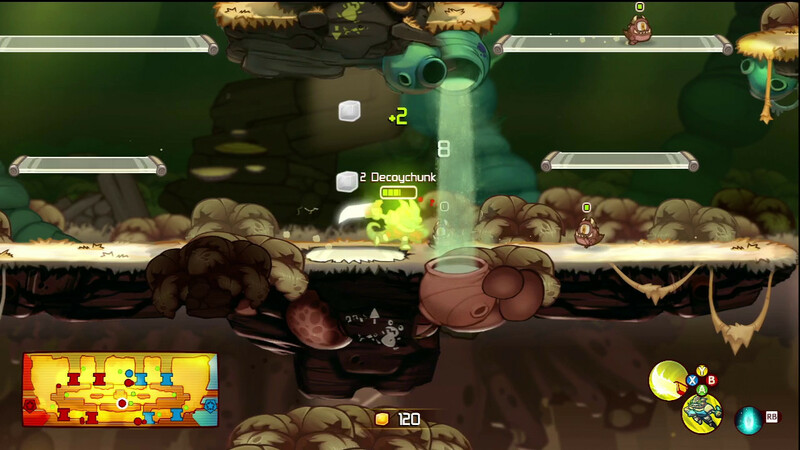 Mobility varies from character to character, ranging from Froggy G’s extremely high single leap to Yuri the monkey’s free-flying jetpack, and passing through the double jump and “Princess Toadstool Float” along the way. Movement speed varies as well, but most of the time you move faster if you aren’t spamming attacks, making pursuit of a fleeing enemy an exercise in moderation. 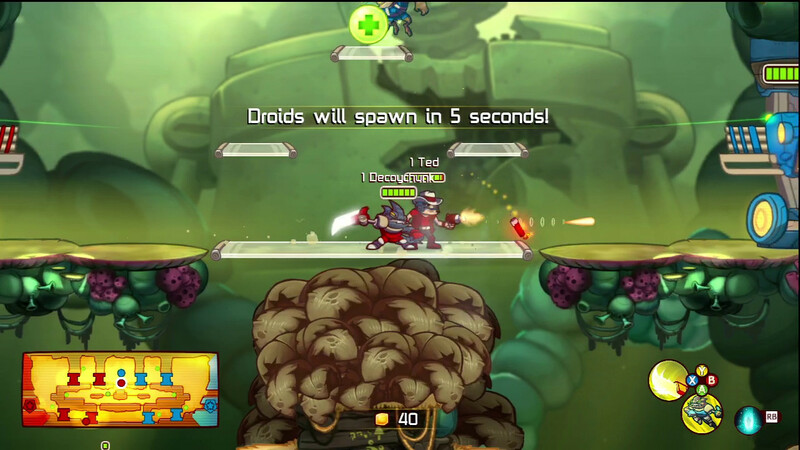 The core gameplay is engaging, requiring you to traverse the level, trailing and protecting your droids until they are near enough to draw the fire of the formidable turrets. Once enough turrets are down to clear the way to the enemy “solar drill”, you can unload your firepower onto it, winning once it is destroyed. Naturally the opposing team has the same goals, and will do its best to kill you, your droids, your turrets, and your drill. This, for the record, is what you would call a poorly protected drill. Much has been done to keep the activity level frantic through the game. 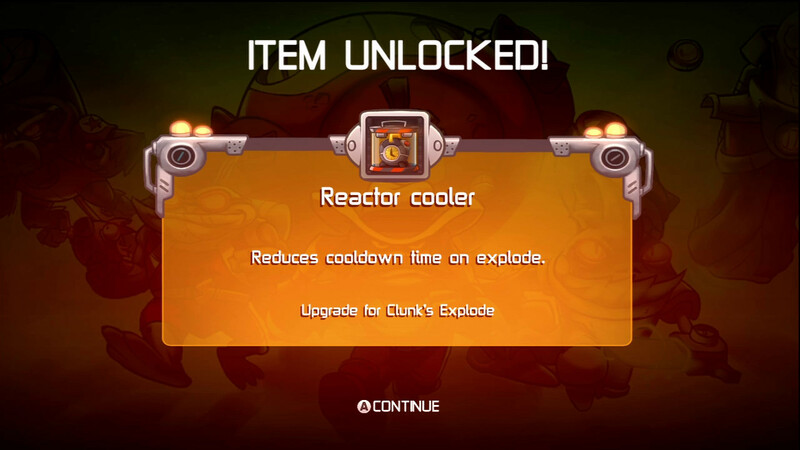 Upgrades are purchased with “solar”, which can be earned through killing things or exploring the level. 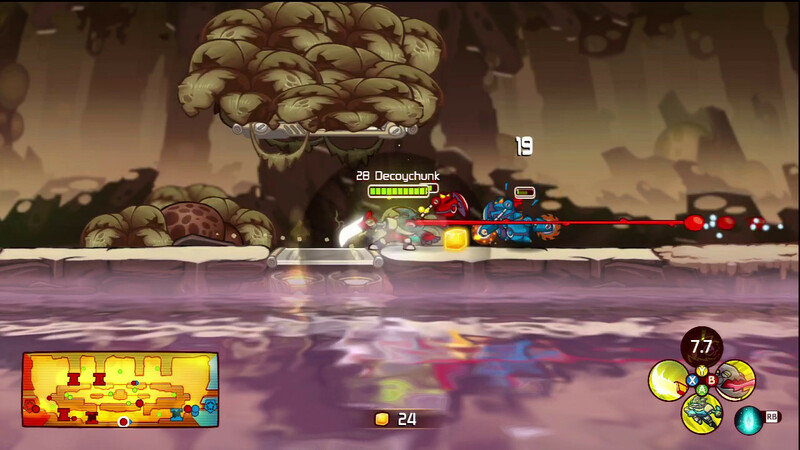 Deaths are punished by the obligatory downtime, but several seconds of that time are devoted to a sort of “orbital drop” mini-game, where you can earn more solar by taking the right path down. Health can be earned by killing passive creatures in certain parts of the map, or by heading back to base by foot or by transport. 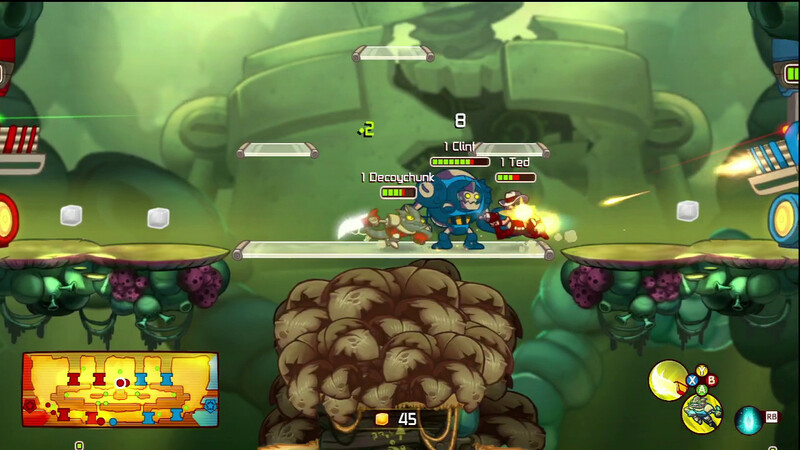 Each game is implicitly 3-on-3, either entirely human, or with bots filling slots, and can happen split-screen or via Xbox Live. 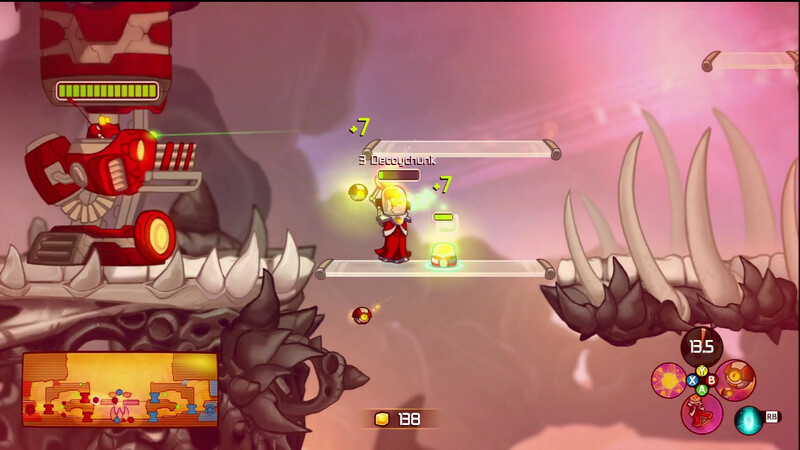 The game is SO multiplayer-based that there is no single-player campaign. 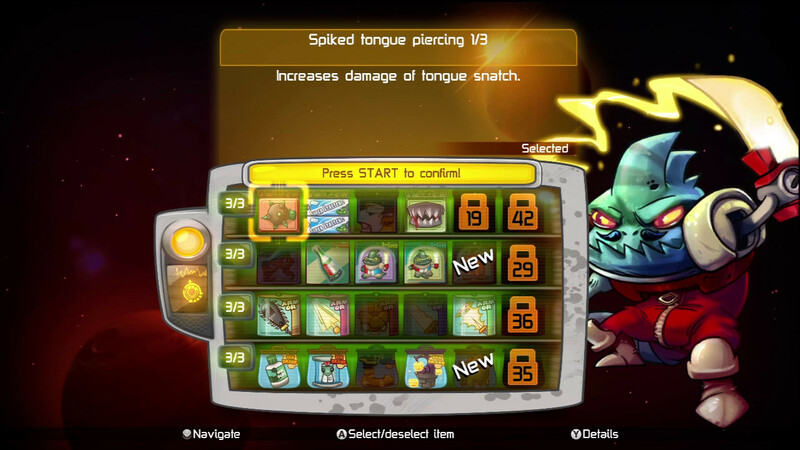 Instead, you’ll need to make do with a “practice” mode, which mercifully allows you to earn solar to build your levels and unlock your characters. 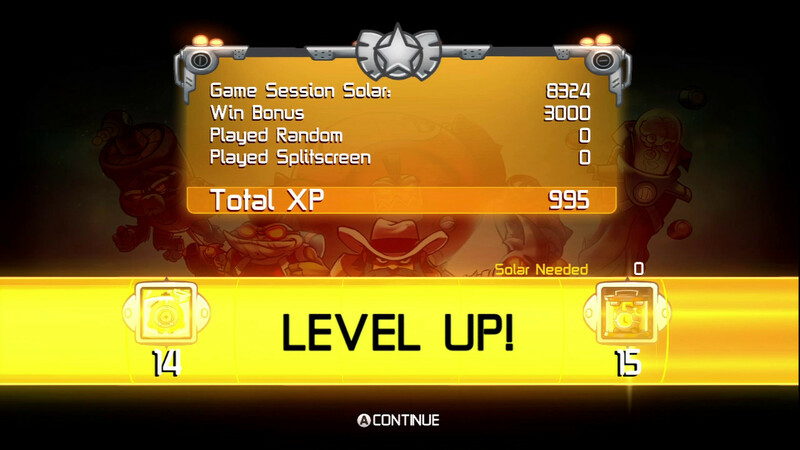 That’s right, each level’s solar not only allows you to level up your character, it allows you to level up your game afterward. 10K solar will earn you a new level, which will in turn earn you a new upgrade item, level, or character, thus encouraging you to play more and more, to see what sort of goodies you can get. The goodies are arranged into a “load out” with four tiers that can each have as many as 3 upgrades, which allows for a ridiculous amount of customization. I direct you once more to the video. The quality of the music and voice continues into the game. In Team Fortress 2 style, each character has got its own personality defined both by visuals and voice. 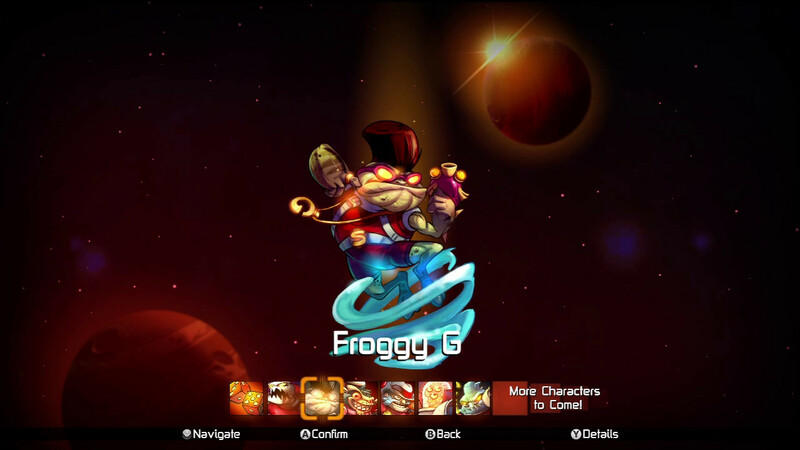 Awesomenauts takes that even further, giving each character its own theme song, too. The music on the levels is high quality, and has gotten stuck in my head, which is more or less my measure of quality in video game audio. 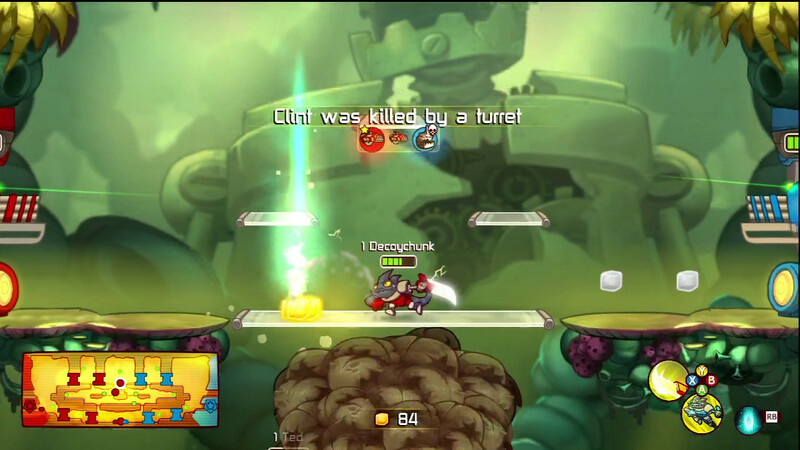 I genuinely enjoyed Awesomenauts. 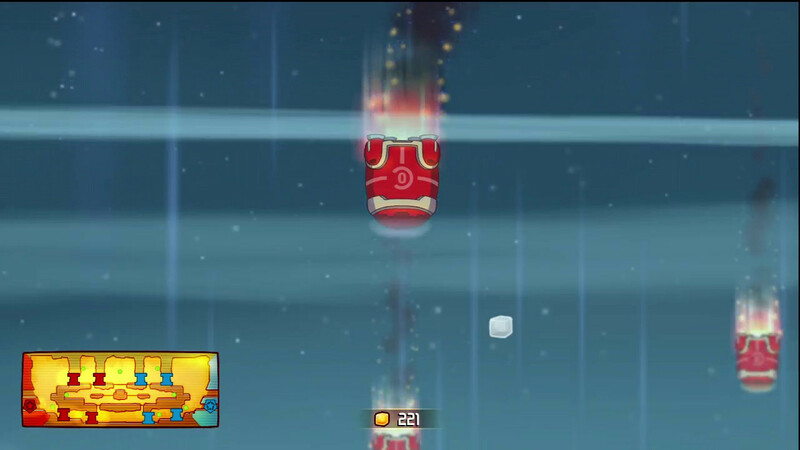 It is slick, well balanced, highly polished, and horribly addictive. Playing with the load outs, testing the characters, or just sitting back and enjoying the view. 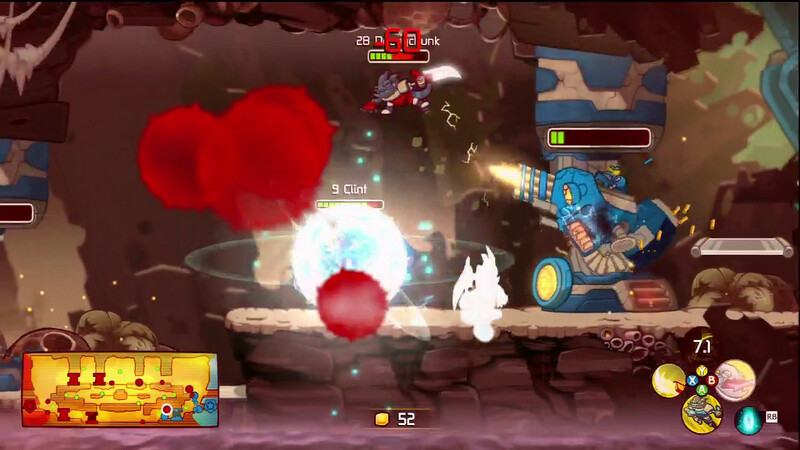 It is a tremendous game that, astoundingly, lives up to its name. 9.8 / 10: A masterful combination of DOTA-style game mechanics and 2D platformer gameplay that is addictive as it is polished.